JERUSALEM (Ma‘an) 19 Aug — UN officials on Tuesday slammed a recent spate of Israeli home demolitions east of Jerusalem and called for an immediate freeze on demolitions across the occupied West Bank. Israeli forces on Monday demolished 22 structures belonging to the Jahalin Bedouin community in eastern Jerusalem, leaving 78 Palestinians homeless, including 49 children, the UN Office for the Coordinator of Humanitarian Affairs (UNOCHA) and the UN agency for Palestinian refugees (UNRWA) said in a joint statement. “According to UN records, this is the largest number of Palestinians displaced in the West Bank in one day in nearly three years,” the statement said. 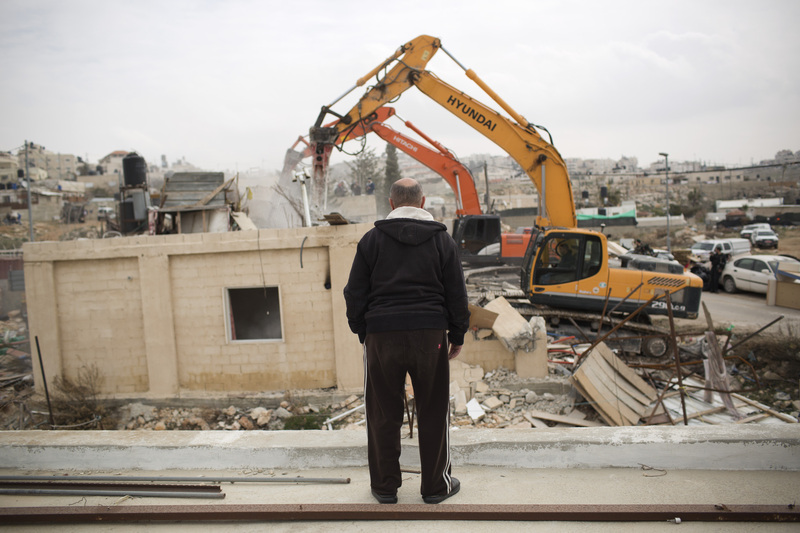 The demolitions all took place in the E1 corridor — a large tract of land between East Jerusalem and the illegal Israeli settlement of Maale Adumim that Israel has earmarked for annexation. 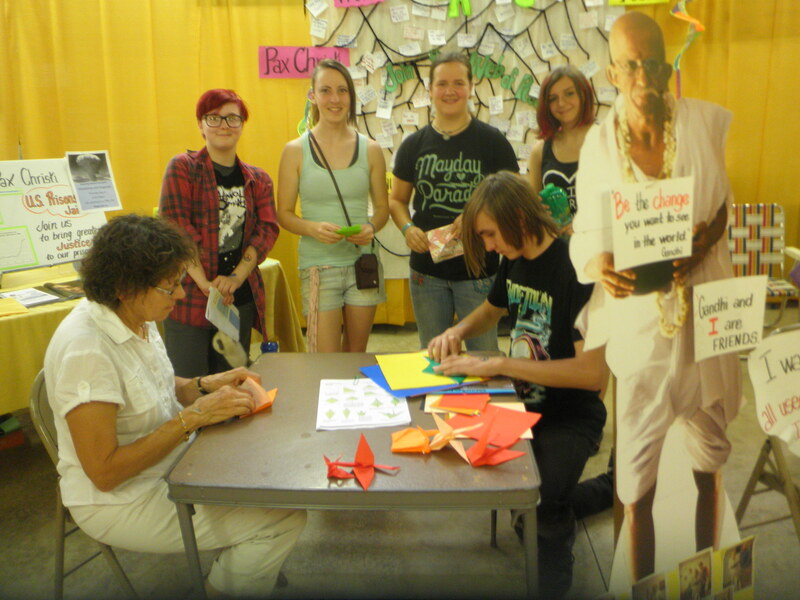 Project Peace and Pax Christi set up booths to share with all passers-by the efforts each organization makes to promote a culture of peace here and beyond. Children were excited when they saw the huge mysterious spider web covering the back wall of our booths. They looked with curious eyes and then wrote their own message, telling other visitors how they want to be a part of this “web” of peace. They got it! Every act of peacemaking spreads to others outside our circle. They received their peace tattoo and left with the admonition to believe in themselves, believe that they also have a part in making this county, this town, this world a better place to live. They were urged to spread kindness freely like candy and treat all people and the earth and its animals with real respect. We tattooed at least 500 children! I see 500 children making efforts to share kindness and respect, building good relationships here in Seneca County. Mahatma Gandhi, who was standing as a cutout in the middle of the two adjacent booths said that in order to have peace in the world, we must start with the children. Through this week—in meeting so many children–it was easy to see why he believed in that premise. Kids’ hearts are usually soft, able to sense an injustice very easily. Kids instinctively know deception–something that is unfair. They mostly show their pain easily and don’t mask the pain with some kind of toughness. They respond easily when they see someone needs their help. 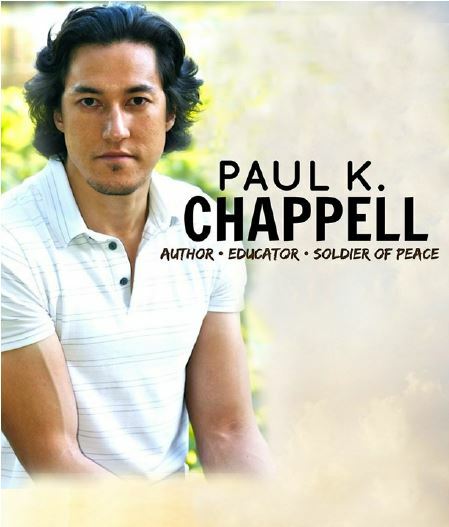 Paul Chappell, whom I’ve introduced before in this column, and who is a leading teacher of nonviolence in the U.S., insists that human beings are NOT naturally, violent. Perhaps he was thinking especially of the children. In Palestine I sometimes witnessed the children asking the soldiers “Why did you kick that boy?” “He didn’t hurt you.” They were not afraid to say the truth. They didn’t worry about possible negative consequences to their truthful questions. At one demonstration in Palestine, the children of a village headed straight toward a row of armed Israeli soldiers and stood like a short but mighty brick wall as they chanted: “We want to sleep! We want to sleep!” The soldiers had been breaking into their homes during the night, tipping over furniture, throwing dishes on the floor, making lots of loud noise. The last thing the kids could do was sleep. Some forms of resistance are stronger than guns. School is now facing us, and children will soon be scurrying along, eager to meet the other kids and teachers after a long summer. Their hopes are high these first days. They want to believe that they are important in the school and to the people outside the school. They will appreciate any encouragement we can give them to aim HIGH, work HARD, enjoy their time with their friends. I shall be stressing with them to try new things, meet new kids, don’t be afraid to move out of their comfort zones in exercising their gifts and kindness. They need us to reassure them. Good luck all you peacemakers: children short and tall, young, and older. With your efforts you not only help your school and your town, but INDEED you give hope to all of us when you help make our world a world of greater peace. Thanks, kids. We need you. Actions will be happening around the world to commemorate the past; and to change the future! Join us on this historic 70th anniversary of the first use of an atomic weapon in war. Make your voice count for the abolition of all nuclear weapons throughout the world. Not only does this apply to Iran but to the United States which has the most nuclear weapons, then to Russia, Israel, India, Pakistan, China, etc….all nations with plenty of warheads to destroy the world many times over. Please join us at the Courthouse Square corner, Tiffin, OH at 4:30- 5:00, Thursday, Aug. 6.